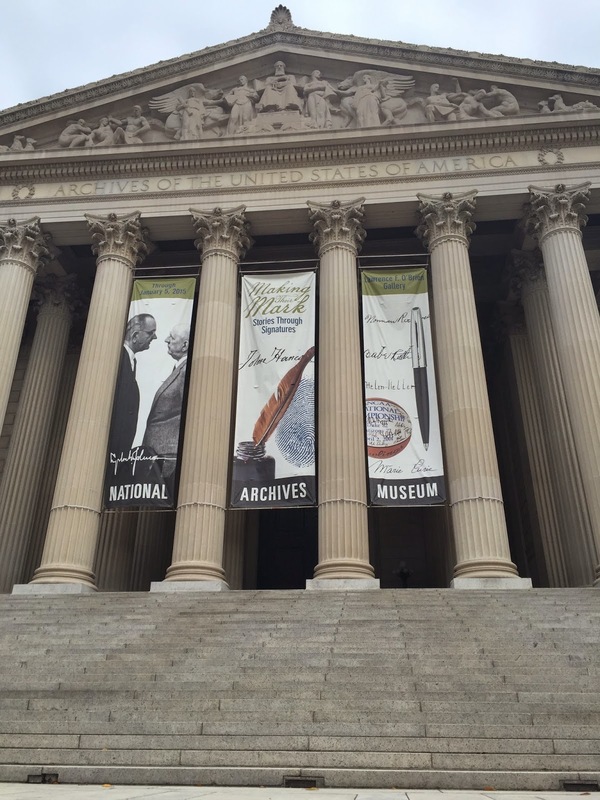 The main reason we visited the National Archives was because we had thought there was a War of 1812 exhibit there closing soon. Apparently, we were wrong or somehow we totally missed it. However, in the half a dozen times I have visited the Archives I have always found there is great temporary exhibit in the Lawrence F. O'Brien Gallery and the current one definitely did not disappoint us. The exhibit is called "Making Their Mark: Stories Through Signatures." It features a variety of items that feature signatures including sports items given to Presidents (Lakers jersey and Giants World Series bat), letters to Presidents from other famous people (Johnny Cash, etc. ), and laws. There is also an interesting part about electronic signatures and duplication machines. Of course, you cannot go to the Archives and not also go through the Rotunda, which is wheelchair accessible through the exit. Seeing the original Declaration of Independence and Constitution is nice; but Mik's favorite part is actually the murals. Also, he was much more impressed by the Declaration of Independence being engraved inside the elevator doors and he has declared them his new favorite elevator doors (so I guess he's solved his dilemma with the Huntsville Airport elevator ranking).